Amazon entered the Indian markets in 2013 amidst great scrutiny from trade analysts, both Indian and global. It was coming to this country fresh from a setback in China after being unsuccessful in toppling local e-commerce giant, Alibaba. However, Amazon proved to have learnt from their mistakes, bringing a fresh approach to India. Voila! 4 years onwards – it is a household name having thwarted the challenge of Snapdeal and Flipkart. Massive capital investment is the foremost thing needed to launch an ecommerce business in India and sustain it for long. India with its population of 1.3 billion has the propensity for rich dividends if you seek it. Jeff Bezos, the founder of Amazon, left no stone unturned in ensuring that the company’s business in this country didn’t suffer due to lack of funds. The next big thing Amazon got right was a masterclass in PR for any foreign company coming to India. It comprehensively convinced the Indians to think of Amazon as an Indian company. It never assumed the look of a foreign brand tasting new waters. “We are as Indian as any other Indian company, and the shareholding of any company is as foreign as Amazon,” said Amit Agarwal, head of Amazon India recently at an event. It is this core thought that Amazon propagated through their marketing initiatives and media relations. 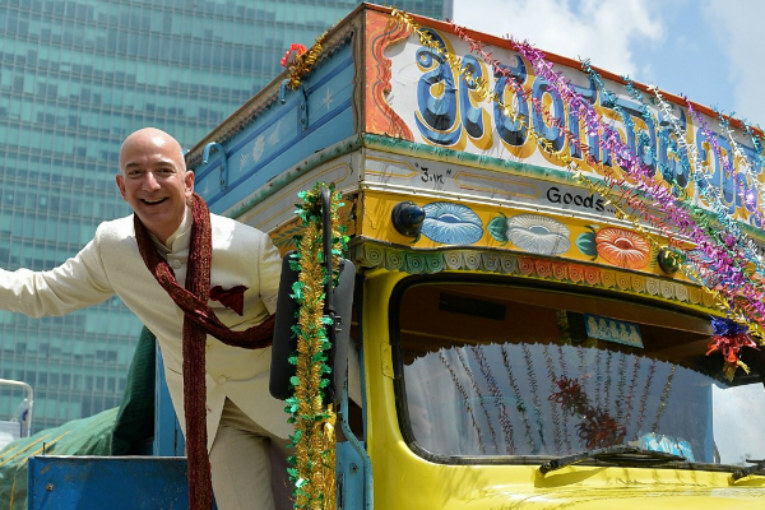 When Jeff Bezos walked out of the airport in New Delhi in a sherwani, posing from atop a truck – he walked straight into the hearts of Indians. Another great innovative PR strategy from the company saw the launch of the Amazon Chai Cart. Amazon identified that if an e-commerce had to reach its full potential in India, small retailers needed to be brought into the fold just as much as the customers. As part of this initiative, the company navigated India’s small towns, districts and even villages on mobile 3-wheeled carts. They went from place to place convincing small-time traders and businessmen about the ease of conducting their business online. Following this, the company launched Amazon Tatkal allowing these businesses to get online in less than 60 minutes flat. Finally, the ultimate move Amazon pulled off was to label them as India’s first ‘Everything Store’ – a store that sold all kinds of products. This included everyday domestic items like hing, churan and other essentials. In fact, grocery constitutes for about 14% of all products sold on Amazon. Successful PR is not about great business; it is about telling a great story, and Amazon has been telling an impressive tale about its endeavours in India.